Many students struggle to show their mathematics skills due to problems with reading and understanding the questions. This app includes many "wordy" questions and repetitive/similar questions worded in different ways. It is essential for "struggling readers" that they carefully read each question and identify words and phrases they cannot understand. Appropriate literacy instruction should then address these areas. Even advanced students make silly mistakes by skim reading the questions. Care should be taken to carefully read each and every question, even if the question appears to be easy. 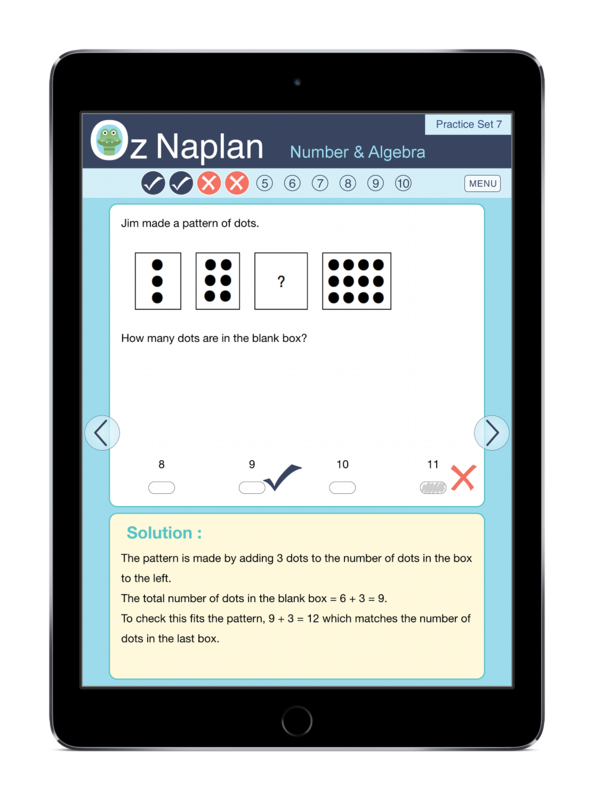 Have the student print out and complete the example test from the NAPLAN website. Familiarity with the test layout and format (on paper) should improve confidence and reduce anxiety on the day of the test. Don't over overemphasise the importance of NAPLAN tests. Many students may be better approaching the tests as a challenge, or an opportunity to learn, rather than something they may be judged on. * This app is not endorsed by the Australian Curriculum, Assessment and Reporting Authority (ACARA), or any part of the Australian Government. This app is not designed to replace Australian Curriculum mathematics instruction. Copyright © 2015 DSP Learning Pty Ltd. All rights reserved.